Today’s turbulent economic conditions and recent past financial crisis urge mortgage loan origination industry to strictly monitor and evaluate its business practices. Various business risks such as credit risk, price risk, interest rate risk, repurchase risk, transaction risk, fraud risk and liquidity risk along with the fluid regulatory landscape; require mortgage lenders to optimize their processes continuously. To maximize profitability and position themselves to success, mortgage lenders must be able to maintain operational efficiency while mitigating regulatory compliance issues on a timely basis. These standards will not, however, be met only by regulatory compliance alone, but with an efficient process in place. The role of a regulatory complying system has a prominent position in bringing about the desired change. RESPA/TILA: This rule mandates Real Estate Settlement Procedures Act (Regulation X) and the Truth in Lending Act (Regulation Z) as a single, integrated disclosure for all mortgage loan transactions to be delivered to customers. The Equal Credit Opportunity Act (ECOA): Regulation B prevents creditors from discriminating against any applicant based on credit transaction. This act also prevents creditors from discouraging a reasonable person from making an application. The Secure and Fair Enforcement for Mortgage Licensing Act of 2008 (SAFE Act): Regulation H requires a residential mortgage loan originator to obtain a state license register with the NMLSR, and obtain a unique identifier. The Home Mortgage Disclosure Act (HMDA): Regulation C sets threshold conditions for lenders to collect, report to federal regulators, and disclose to the public certain data about applications and origination. This also sets conditions for purchases of, home purchase loans, home improvement loans, and refinancing. The Fair Credit Reporting Act (FCRA): Regulation V, sets requirements for collecting and disclosure of credit score information, disclosure of adverse action, and disclosure of risk-based pricing to determine a customer’s creditworthiness. Mortgage Acts and Practices – Advertising Rule (MAP Rule): Regulation N sets for specific advertising practice regulations for entities such as nondepository mortgage lenders, state-chartered credit unions that market and advertise mortgage products. Dodd-Frank Act, Section 941: Mandates retaining of 5 percent of the credit risk of the assets collateralizing the asset-backed securities for securitizers of asset-backed securities, including mortgage-backed securities. Basel II/III: These regulations are for international capital requirements, urging banks to hold more capital against risk-weighted assets. Servicemembers Civil Relief Act: This act protects servicemembers by providing benefits for loans held including a maximum rate of interest of 6% and foreclosure protection. 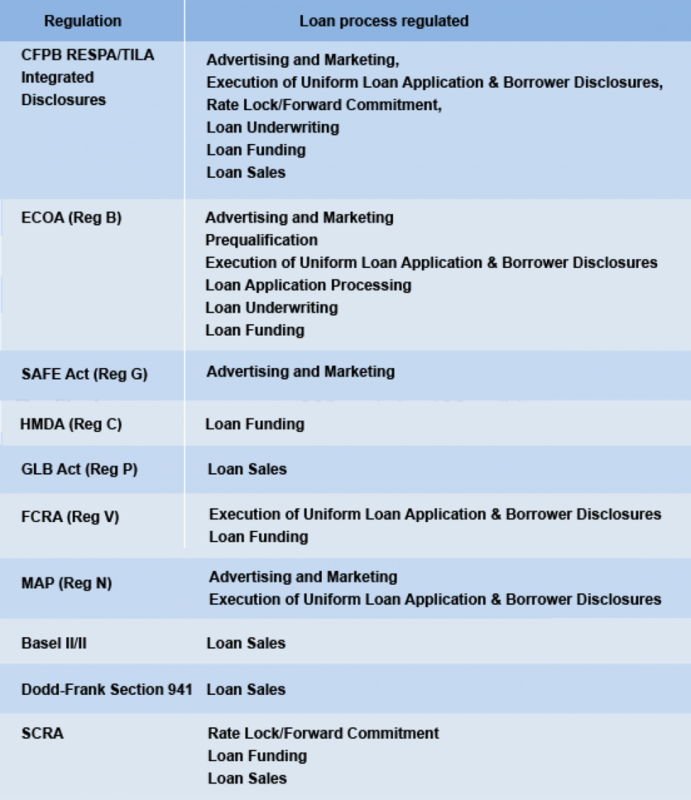 Each of these regulations under various circumstances comes into play when loans are originated. To comply with and generate maximum number of loans, it takes a dedicated, highly automated loan origination system that integrates various providers under one roof. Encompass360 has a sophisticated compliance management system that mostly automates compliance and allows customization when required. Looking for Encompass compliance consulting services? Please contact us to get started.